In working on my little sketchbook, There have been some pages that I don't really like. There have also been times when art from one page bleeds through the back side to the next page. As a solution, I've been pasting in some drawings I've been making outside of the book itself. This helps avoid bleed-through when I use markers. One of the pages I've made (this will be cut into three strips) was a few little meditations on leopard print. 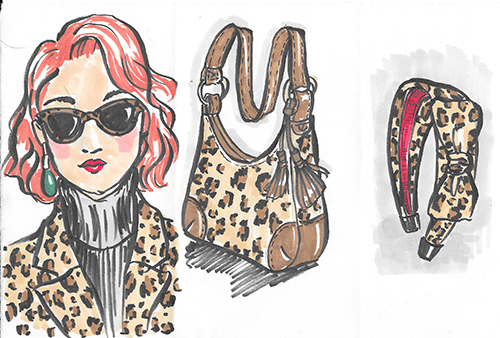 I always have a hard time drawing leopard print digitally, but it turned out much better when I was drawing by hand. I have a little over half of the book left, but it's been fun working on this when I get a little free time here and there. Stay tuned! More to come.